It's a Brent Benjamin Weekend! As we get closer to West Virginia's election in May we are bound to read more and more about Judge Brent Benjamin. (He's a local "newspaper" favorite!) Yesterday's and today's "newspapers" got us off to a good start. Saturday's Intelligencer featured a Mike Myer column praising Benjamin while disparaging one of his opponents, the hated Darrell McGraw. (I think that most long-time readers of Wheeling's "newspapers" would agree with me that no one comes close to the amount of animosity the locals have shown toward the former attorney general.) After discussing McGraw who, like Benjamin, is running for the State Supreme Court, Myer explains how McGraw could win since it's a crowded field and the winner will not need a clear majority of the votes cast. Do we really want new laws forced on West Virginians by as few as three of the five Supreme Court justices? Should any three people have that much power? The incumbent running against McGraw, Justice Brent Benjamin, doesn't think so. Legislators, not justices, were elected to make law, he believes. That's the platform he was elected on in 2004, when he defeated Warren McGraw, who is Darrell's brother. Since then, Benjamin has kept his word. His rulings have been straight down the line, based on law and the state constitution, not what special interests want. That has disappointed some of them. "The Best Judge $3 Million Can Buy" by Blake Fleetwood in Huffington Post in 2009 detailed how Benjamin got the seat in the first place. The case -- Caperton v. A.T. Massey Coal - began when Don Blankenship, chairman and CEO of Massey, lost a $76 million verdict in a fraud lawsuit brought by smaller rival, Hugh Caperton, in West Virginia. Caperton was driven out of business by Massey. Coal Baron Blankenship is not a man who likes to lose. He is a Huey Long type character who looms large over the political landscape of West Virginia. He looked at the members of the state Supreme Court and decided he didn't like some of them. Why not buy a new judge? Blankenship had the audacity to target Judge Warren McGraw, who he thought was anti-business and would rule against him. Blankenship spent $3 million in odious, nasty attack ads destroying the liberal Judge, and getting his man, an unknown Brent Benjamin, elected in 2004. The money did the job. Caperton asked Judge Benjamin to recuse himself three times, because he obviously could not be impartial toward Blankenship, who had literally bought him his court seat. Benjamin refused each time saying he could absolutely be impartial. Three years later, Benjamin, predictably cast a critical vote in a 3-2 decision that sided with Blankenship and threw out the $76 million verdict. Spending $3 million to save $76 million sounds like an effective use of corporate funds for Massey Coal. The $3 million that Blankenship spent on the race was more than two-thirds of all the total money raised in the election. "Benjamin was elected," Leamer said, "as Blankenship's creature." If you think that the Huffington Post and Leamer embellished what happened, do your own research - this case is quite famous on the web. 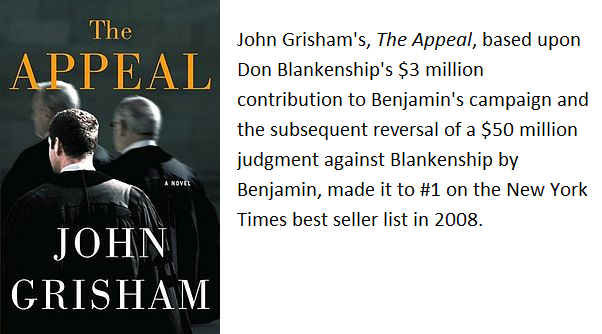 Benjamin and Blankenship are discussed on almost every website that examines the enormous role that big money plays in our election system or, more specifically, that looks at big money's role in the election of judges. I've read about Benjamin's first election a number of times and each time I revisit it I'm once again appalled at what happened -- and now the Intelligencer has launched his re-election effort as though none of it ever happened. When he's not digging into court records while weighing how he'll ruling on a landmark case, West Virginia Supreme Court of Appeals Justice Brent Benjamin likes to spend time unearthing millenia-old treasures in Egypt's Valley of the Kings. Except that the article seems to suggest that his last visit was in 2005. I read the article a couple of times and I could not find anything that could be labeled "news" let alone something that deserved to be on the front page. Feature articles usually engage us but this one gives us no compelling reason to read it; it's a hodgepodge of old news, Benjamin quotes, and Wikipedia-like info. It's not news and it's a terrible feature story so why was it published? Easy, it's all about the promotion of Brent Benjamin.